I’ve got the following growing outside in one of the raised beds. 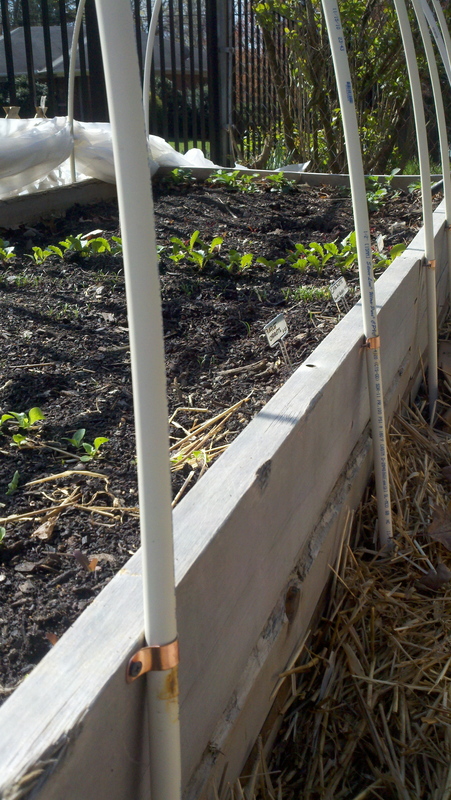 On February 24th I planted the following cool-weather seeds from Sow True Seed: Asian greens, buttercrunch lettuce, a lettuce mix, purple carrots, scarlet Nantes carrots, watermelon radish, and bulls’ blood beets. A couple of friends have asked me what else is safe to plant from seed outside right now. The Farmers’ Almanac has planting dates for Asheville listed in chart form. 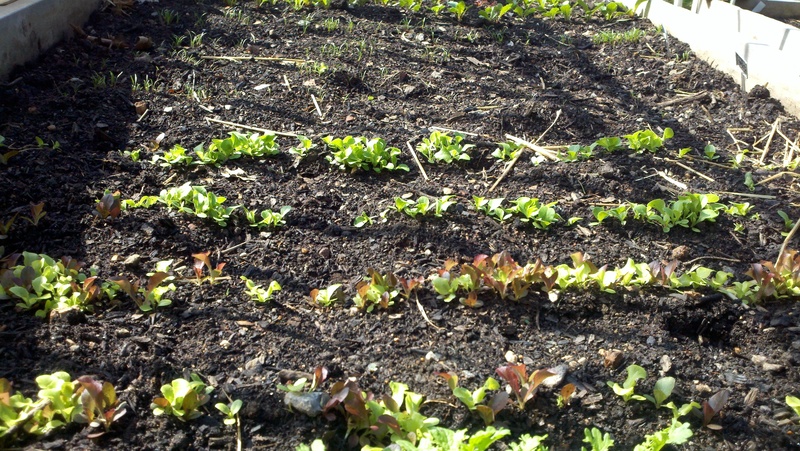 You can also check out the 2011 Planting Guide from Sow True Seed. Note white PVC pipe. I spent an hour this morning painting it green to match the hoops over the other beds. Gardening vanity. Another option is to buy cool-weather starts from a nursery center. You can find all kinds of things right now, like lettuce, broccoli, spinach, cabbage, cauliflower….if you’d rather not wait for the seeds. My husband bought some red onion sets, lettuce and broccoli starts at a garden center a few weeks ago so we’ve got those going in another one of the raised beds too. 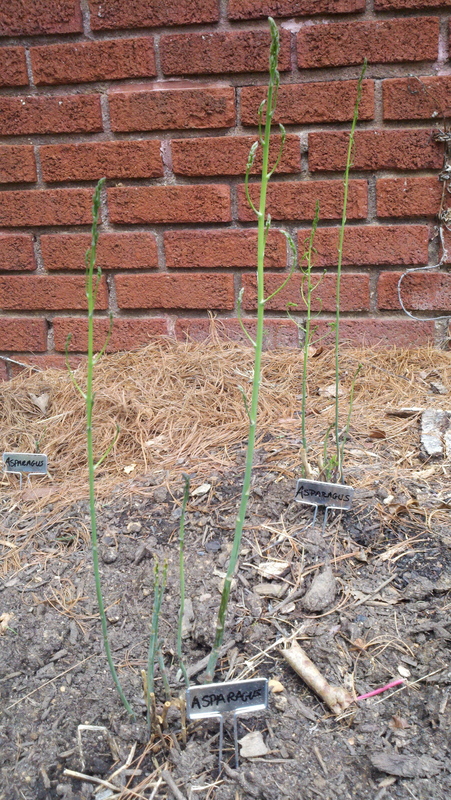 Last year about this time I planted 8 Mary Washington asparagus crowns that are coming up now (although I won’t harvest any till next year….I was so tempted to harvest some of the early shoots, but Dad said it would weaken the plant). I also planted seed potatoes last March in the beds, and also in some giant pots (that’s on my to-do list for this weekend). 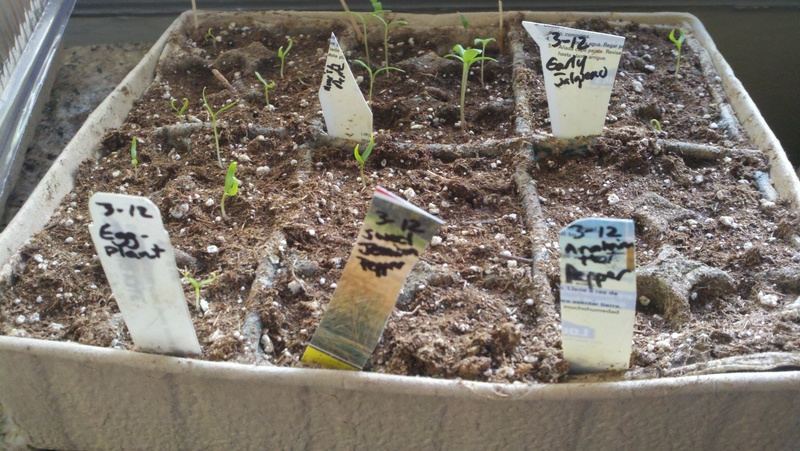 My tomato, pepper, eggplant, tomatillo and epazote seeds are coming along well inside. I’ve been transporting them outside on warmer days when the March winds aren’t wild like today. 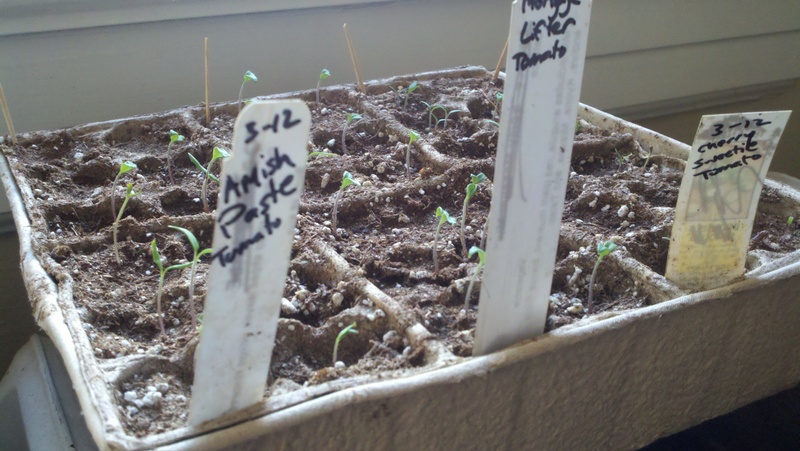 The seedlings are resting happily on top of the radiator in the southern-facing window in my dining room. I’ve got the trays sitting on top of old cookie sheets. It’s cold enough today that the radiators have turned on a few times, warming up the potting soil — I hope it encourages some of the peppers to emerge, as I’ve yet to see any Pasillo, Marconi, or Pobanos coming up. 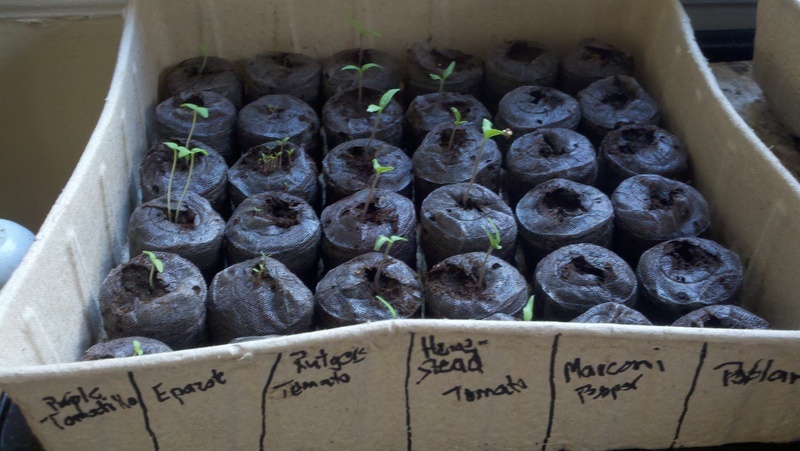 The pepper seedlings are reminding me of my pepper plants every year — they are always the last plants to produce in the garden. It has to get really hot for a couple weeks for them to start getting peppers on their branches. There’s still a fair amount of greens out in the beds, so I tried another recipe from the Natural Health Magazine article my neighbor gave me. This one was “Warm Mustard Greens Salad”. I used both the red mustard green leaves (really spicy) and the regular ol’ green ones. The dressing was lemon juice, honey, olive oil, salt & pepper, and water. I used some of the honey I’d harvested recently. So yum. The other ingredients were: fresh ginger, red onion, garbanzo beans, cumin, chili powder, shredded carrot and feta cheese. What a great salad — it was like eating wasabi in leaf form, with the bite and spice tempered by the garbanzos, carrots and feta. Some of the heat came from the chili powder (it was just a half teaspoon but it had chipotle peppers in it too), but it was mainly from the mustard greens themselves. 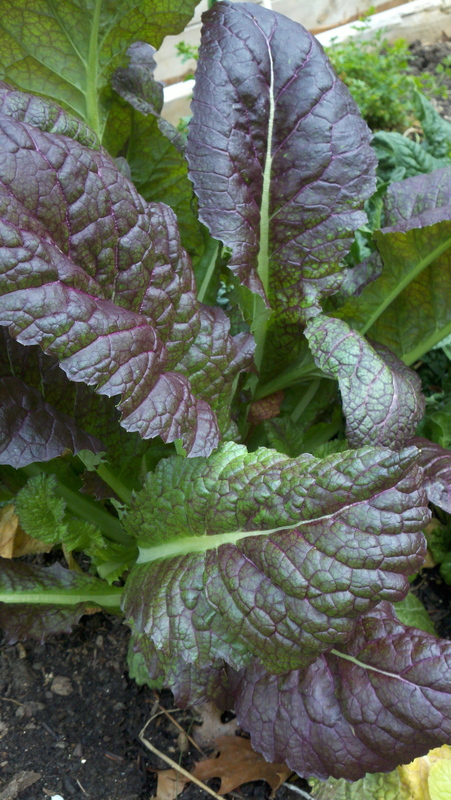 Growing up in the South, my only experience with mustard greens was cooked (and cooked and cooked) along with some kind of fatback. 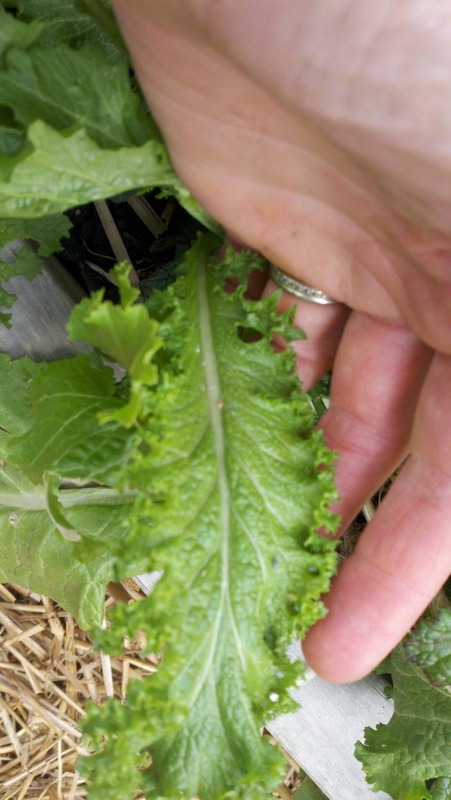 I love most other greens cooked, especially collards, but I never learned to love cooked mustard greens. I think it was a combo of a texture issue (soggy) and bitter taste. After finding this recipe, I’ve made peace with mustards. 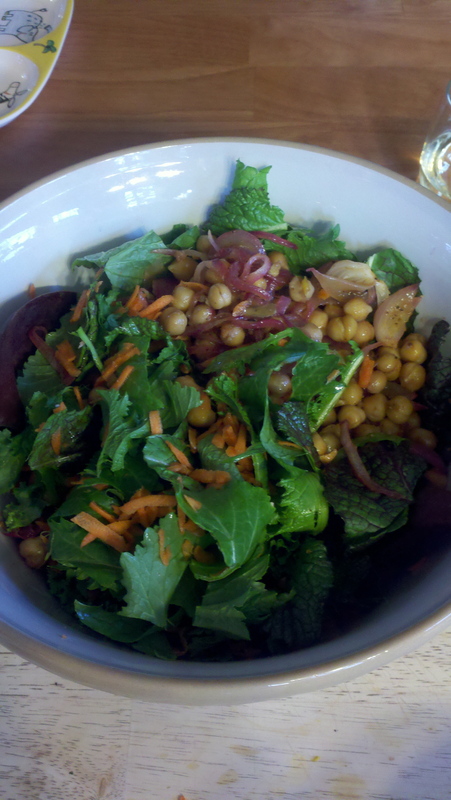 Now, if you’re not into spicy, be warned that this salad indeed has a kick, but it sure is good (or as my Mississippi-raised grandmother would have said, “Shuh ’nuff”, although I’m sure she would’ve thought raw mustard greens blasphemous). The recipe sounds YUMMY! I’m learning a lot from your posts. Thanks for sharing.